Water your plants; Play target practice outdoors or in your bath; Use watered down coloured inks to create splatter art; Cool your dog down on a hot day; Clean a dirty relative; Spray your neighbour then hide; Wash a car (very slowly); Fill the bird bath; Rinse off the dishes; Fill water balloons; Squirt yourself; Fill an animal's water dish; Spray clothes for ironing; Cool off a friend after exercising; Give players a drink at athletic events; Write water messages on the pavement; Shoot at paper targets; Wet down someone's hair when getting a haircut; Have fun! Most of the components used are commonly available from Electronics stores such as Maplin Electronics. 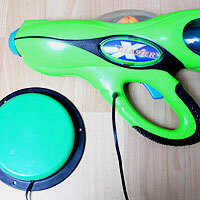 The "X-Blaster" can/could be found in Homebase in the UK and occassionally on auction site eBay internationally. Cordless drill with drill bits (1x 1/4" for socket); Knife or wire strippers; small screwdriver set. 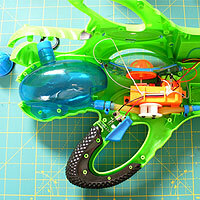 Remove all screws from the gun, then carefully prize both sides apart, being careful not to overstretch any wires. 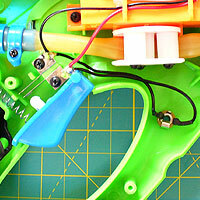 Lean the controller against something to stop any stretched wires breaking off. Make a small pilot hole then drill your 1/4" hole as pictured. Solder two lengths of wire to each socket. Melt shrink wrap around the solder points to help prevent short circuits. 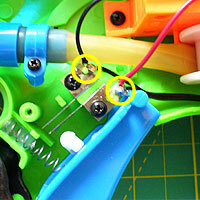 Carefully solder both trailing wires from the socket to the two encircled contact points of the trigger switch. Ensure that the wires will not catch on anything, using cable-tidies if necessary. Grease any points that look as though they may cause friction over time. 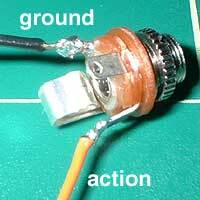 If there are any problems, very carefully inspect the quality of your soldering, and look out for short circuits. After a premliminary test, glue your socket into place then screw it into place tight. 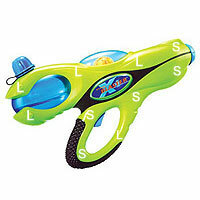 Carefully reassemble the gun, ensuring that no wires catch between the two sides of the case. The image left shows where to fit Large screws and Short screws. 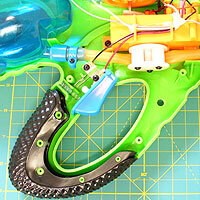 Carefully reassemble the gun, ensuring that no wires catch between the two sides of the case. The fun bit (at last): Test the gun with water in. Any problems, then check over all your wiring for accuracy. Check that you've not snagged and broken any wires. Check that the revolving half-ball is pushed down far enough to clear touching the surrounding case.